What is your why? What is your WORD? I’ve decided after reading The Innovators Mindset last summer, to reread and join the IMOOC as part of connecting ( Connect is my word for 2017) more for 2017. I was so inspired initially reading the text, I felt like highlighting entire pages and was literally screaming YES! YES! at the end of every few pages. While reading the book the first time, I was in the process of taking an entrepreneurship course which was pushing me to clarify my vision for my business and made me begin to redefine the purpose and next steps of Branches Of Learning. Naturally it was, increased innovation. After years of saying I wanted to start a non-profit organization, I finally did immediately after reading this book because I wanted to find ways to serve, collaborate and innovate more within education and my community. I launched BIG On Learning, a non-profit fundraising organization who’s aim is to support and promote innovative education initiatives and solutions to enhance learning opportunities for students, parents and teachers in Anguilla, in the British West Indies. I believe in creating flexible learning spaces and learning opportunities and that’s where my vision and shift was taking me in my business toward personalized blended learning options for children on the island of Anguilla. So changes are getting ready to take place, and I know they are going to be amazing. 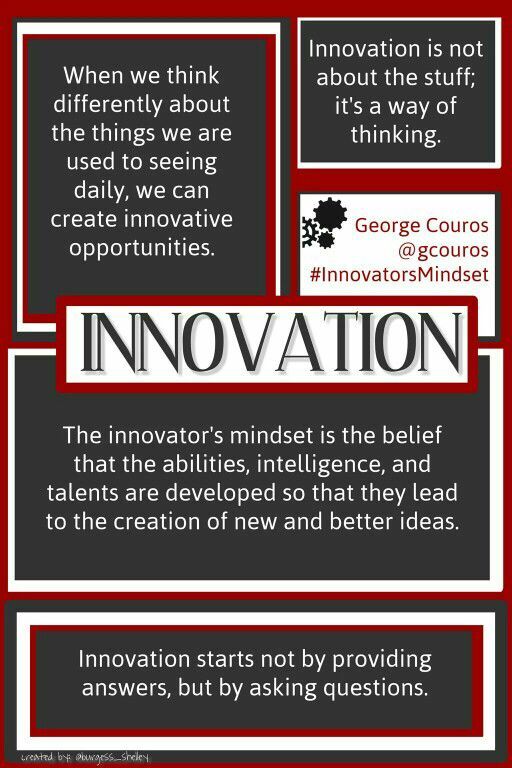 I’m glad you’ll be on this journey with me as I reread The Innovators Mindset and blog about my innovation . The quote “Change Is An Opportunity To Do Something Amazing” resonated with me again as I reviewed chapter one. This week I hosted my monthly Facebook LIVE called BOL Talk Tuesday where I share, listen and engage with parents, teachers, education stakeholders primarily on the island of Anguilla, but of course open to the world on hot topics in education, innovation and much more. My topic for February was “For The Love Of Learning”! I’m realizing now that the three tips I gave align with my reflections about chapter one of the book. My Second Tip creeps a bit into chapter two. For The Love Of Learning! Develop risk takers. In order to develop risk takers you must support and develop a growth mindset and embrace failure because it is all part of the innovation process. Change is about stepping out of ourselves and into the learner, in order to meet their needs. So again it made me question, how am I innovating in my after school program development, instructional coaching and even education advocacy. How am a choosing techniques that empower instead of what just may be easy for me at times. My Third Tip was: For The Love Of Learning! Collaborate Don’t Compete. Many times some schools cultures can become very competitive not just for the students but the teachers and administrators as well. We all want to be the best, our children to be the best, to be the best teachers or leaders but we don’t have to compete in order to do it. In looking at the definition of innovation used in the book, “ innovation as a way of thinking that creates something new and better”, what better way to do that than through collaborating with others. When we develop collaborative cultures we also are naturally building community in our classrooms, schools, community and of course through this IMOOC, the world! When we collaborate we are lead to question differently which leads to innovation. 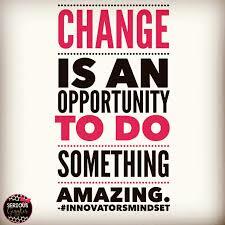 So yes, change is an opportunity to do something amazing, but questions spur amazing inspiration to innovation. I am reminded to question my why; question the risks I am taking to empower and impact; and question the power of strategic collaboration to innovate and create optimal learning experiences for learners to do amazing things.